Narrabri Shire Council has recently approved a number of significant development proposals for the Narrabri CBD with a total capital investment value of over $5 million. “The old Roads and Maritime Services building in Maitland Street will make way for the Reject Shop, while the plans have been approved for the old Woolworths building to be replaced by a new retail premises,” explained (Acting) Director Development and Economic Growth, Mr Daniel Boyce. The recent ownership change of the Tourist Hotel has paved the way for big renovation plans for that premises. The renovations are slated to include an update of the accommodation and a complete refurbishment of the restaurant, bar and outdoor entertainment areas. “While a number of towns are losing their retail enterprises, developers are showing confidence in Narrabri Shire,” stated Economic Development Manager, Mr Bill Birch. “The old Woolworths building in particular will provide a real anchor for the northern end of the CBD.” Despite the drought, the local economy is showing other strong signs with the Australian Bureau of Statistics reporting the Gross Regional Product (GRP) for Narrabri Shire in 2016/2017 was $1.2 billion. 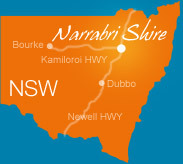 Over the past five years, the GRP for Narrabri Shire has grown at an annual average of 2.1%. “The Agriculture, Forestry and Fishing sector experienced the highest annual increase in GRP last financial year rising by 19.3%, which supports the strong interest we are experiencing here in Narrabri Shire,” explained Mr Birch. This GRP growth coupled with the trend bucking growth in the Shire population will no doubt see continued and keen investment interest in Narrabri Shire. “Strength in our major industries of Agriculture and Mining bolsters the economic activity within the rest of the community including in our CBD’s and with the advent of Inland Rail and multiple large scale solar projects currently before the NSW Government there is even more reason to be optimistic,” concluded Mr Birch.